In the winter of 1920, a quirky bequest draws Morrie Morgan back to Butte, Montana, from a year-long honeymoon with his bride, Grace. But the mansion bestowed by a former boss upon the itinerant charmer, who debuted in Doig's bestselling The Whistling Season, promises to be less windfall than money pit. And the town itself, with its polyglot army of miners struggling to extricate themselves from the stranglehold of the ruthless Anaconda Copper Mining Company, seems—like the couple's fast-diminishing finances—on the verge of implosion. These twin dilemmas catapult Morrie into his new career as editorialist for the Thunder, the fledgling union newspaper that dares to play David to Anaconda's Goliath. Amid the clatter of typewriters, the rumble of the printing presses, and a cast of unforgettable characters, Morrie puts his gift for word-slinging to work. As he pursues victory for the miners, he discovers that he is enmeshed in a deeply personal battle as well—the struggle to win lasting love for himself. 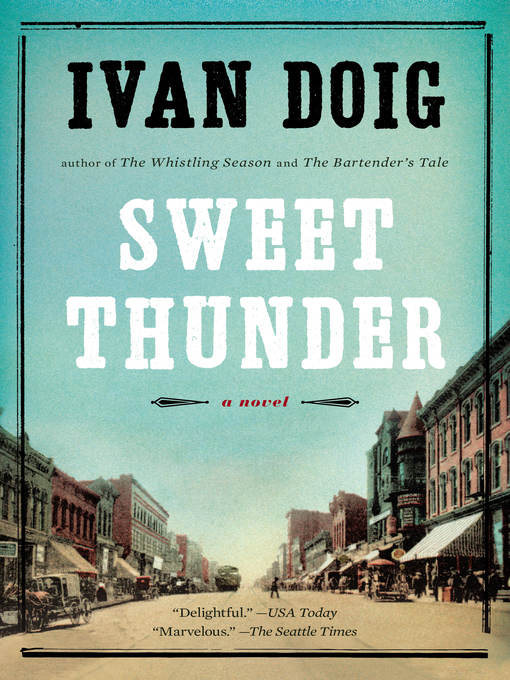 Brilliantly capturing an America roaring into a new age, Sweet Thunder is another great tale from a classic American novelist.